Astronomers using NASA’s Hubble Space Telescope have discovered that the universe is expanding 5 percent to 9 percent faster than expected. “This surprising finding may be an important clue to understanding those mysterious parts of the universe that make up 95 percent of everything and don’t emit light, such as dark energy, dark matter, and dark radiation,” said study leader and Nobel Laureate Adam Riess of the Space Telescope Science Institute and The Johns Hopkins University, both in Baltimore, Maryland. The results will appear in an upcoming issue of The Astrophysical Journal. Riess’ team made the discovery by refining the universe’s current expansion rate to unprecedented accuracy, reducing the uncertainty to only 2.4 percent. The team made the refinements by developing innovative techniques that improved the precision of distance measurements to faraway galaxies. The team looked for galaxies containing both Cepheid stars and Type Ia supernovae. Cepheid stars pulsate at rates that correspond to their true brightness, which can be compared with their apparent brightness as seen from Earth to accurately determine their distance. Type Ia supernovae, another commonly used cosmic yardstick, are exploding stars that flare with the same brightness and are brilliant enough to be seen from relatively longer distances. By measuring about 2,400 Cepheid stars in 19 galaxies and comparing the observed brightness of both types of stars, they accurately measured their true brightness and calculated distances to roughly 300 Type Ia supernovae in far-flung galaxies. The team compared those distances with the expansion of space as measured by the stretching of light from receding galaxies. The team used these two values to calculate how fast the universe expands with time, or the Hubble constant. The improved Hubble constant value is 73.2 kilometers per second per megaparsec. (A megaparsec equals 3.26 million light-years.) The new value means the distance between cosmic objects will double in another 9.8 billion years. This refined calibration presents a puzzle, however, because it does not quite match the expansion rate predicted for the universe from its trajectory seen shortly after the big bang. Measurements of the afterglow from the big bang by NASA’s Wilkinson Microwave Anisotropy Probe (WMAP) and the European Space Agency’s Planck satellite mission yield predictions for the Hubble constant that are 5 percent and 9 percent smaller, respectively. Comparing the universe’s expansion rate with WMAP, Planck, and Hubble is like building a bridge, Riess explained. On the distant shore are the cosmic microwave background observations of the early universe. On the nearby shore are the measurements made by Riess’ team using Hubble. There are a few possible explanations for the universe’s excessive speed. One possibility is that dark energy, already known to be accelerating the universe, may be shoving galaxies away from each other with even greater—or growing—strength. Another idea is that the cosmos contained a new subatomic particle in its early history that traveled close to the speed of light. Such speedy particles are collectively referred to as “dark radiation” and include previously known particles like neutrinos. More energy from additional dark radiation could be throwing off the best efforts to predict today’s expansion rate from its post-big bang trajectory. The boost in acceleration could also mean that dark matter possesses some weird, unexpected characteristics. Dark matter is the backbone of the universe upon which galaxies built themselves up into the large-scale structures seen today. And finally, the speedier universe may be telling astronomers that Einstein’s theory of gravity is incomplete. “We know so little about the dark parts of the universe, it’s important to measure how they push and pull on space over cosmic history,” said Lucas Macri of Texas A&M University in College Station, a key collaborator on the study. The Hubble observations were made with Hubble’s sharp-eyed Wide Field Camera 3 (WFC3), and were conducted by the Supernova H0 for the Equation of State (SH0ES) team, which works to refine the accuracy of the Hubble constant to a precision that allows for a better understanding of the universe’s behavior. The SH0ES Team is still using Hubble to reduce the uncertainty in the Hubble constant even more, with a goal to reach an accuracy of 1 percent. Current telescopes such as the European Space Agency’s Gaia satellite, and future telescopes such as the James Webb Space Telescope (JWST), an infrared observatory, and the Wide Field Infrared Space Telescope (WFIRST), also could help astronomers make better measurements of the expansion rate. Before Hubble was launched in 1990, the estimates of the Hubble constant varied by a factor of two. 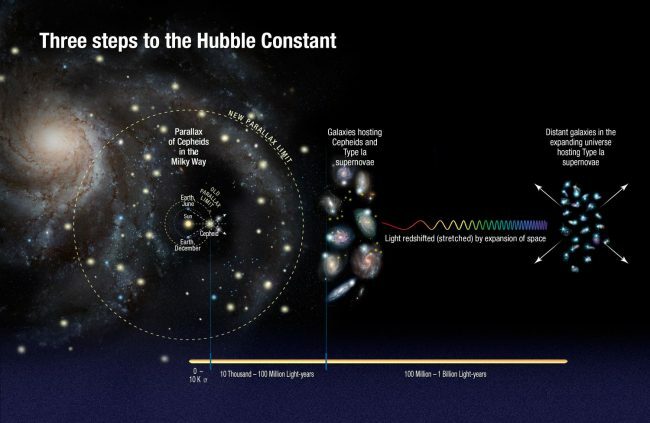 In the late 1990s the Hubble Space Telescope Key Project on the Extragalactic Distance Scale refined the value of the Hubble constant to within an error of only 10 percent, accomplishing one of the telescope’s key goals. The SH0ES team has reduced the uncertainty in the Hubble constant value by 76 percent since beginning its quest in 2005.